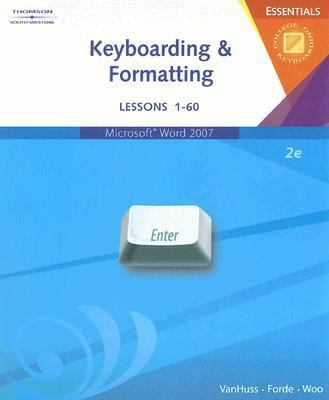 by VanHuss, Susie H., Forde, Connie M., Woo, Donna L.
VanHuss, Susie H., Forde, Connie M., Woo, Donna L.
KEYBOARDING ESSENTIALS, 2nd Edition: KEYBOARDING & FORMATTING, LESSONS 1-60, will teach new key learning and basic document formatting using the functions of Microsoft Word 2007! Lessons 1-25 are focused on teaching the alphabetic keyboard, top row numbers and symbols of the keyboard, and the numeric keyboard with the use of Keyboarding Pro 5 Deluxe. The remaining lessons will focus on traditional skill building, language arts, and document formatting. Word processing skills are isolated and introduced prior to document formatting lessons, while proofreading skills are reinforced within the documents. The document formatting lessons are devoted solely to documents and teach no additional word processing functions so users can focus on proper formatting techniques.VanHuss, Susie H. is the author of 'Keyboarding and Formatting Essentials Lessons 1-60', published 2007 under ISBN 9780538729765 and ISBN 0538729767. Loading marketplace prices 41 copies from $0.51 How does the rental process work?